Acer Palmatum 'Rhode Island Red Dwarf' is a moderate growing tree that can be grown in USDA Plant Hardiness Zones 5A through 9B. It matures to an average height of 5 feet to 6 feet and an average width of 2 feet to 3 feet, depending on climate and other environmental factors. 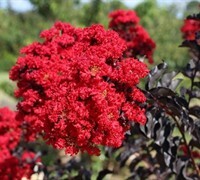 The foliage is red, bronze and medium green in color. Rhode Island Red Dwarf Japanese Maple can be useful in the landscape in containers or planters, as a border or edger, around decks, swimming pools, and other outdoor living areas, as an accent, as a focal point, to frame the corners of a home or other building, to add property value, to accentuate entryways, in medians or as a street tree and also in theme gardens.